A one-off Aston Martin DB10 that starred in the latest James Bond movie, Spectre, has been auctioned in Dubai. Guests of the British Embassy made silent bids for the supercar at a black-tie event ahead of the upcoming charity auction in London. They were treated to a close look at the car driven by actor Daniel Craig in the 007 spy-action flick at a black-tie event organised at the embassy by Aston Martin. 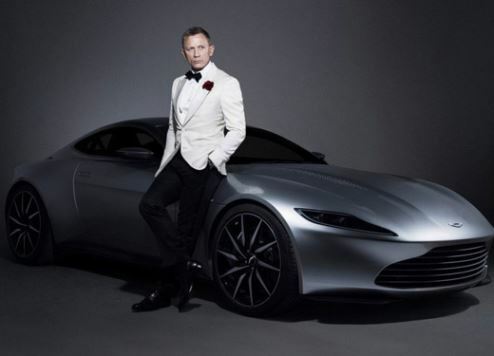 The British car manufacturer, which has a long-standing association with the Bond franchise, said proceeds from actual auction, which will be hosted by Christie’s auction house in London this month, will be donated to Médecins Sans Frontières. “Considering the £1million to £1.5million (AED5.2 million to AED7.8 million) estimate on the DB10, that’s a considerable donation,” the car firm said in a statement. The auction will coincide with the release of Spectre on DVD and Blu-ray, and will feature 24 lots in total. Other sale highlights include the custom laptop used by Q (£4,000-£6,000 estimate), as well as the Omega Seamaster 300 watch worn by Craig in the film, which is estimated to attract bids of £15,000-£20,000. Neil Slade, regional director for Aston Martin in the Middle East, said the chance to bid for and own a DB10 of this calibre was a once-in-a-lifetime opportunity. In October 2012 Dubai’s diplomatic set celebrated the premiere of the Bond film at the time, Skyfall, on the 50th anniversary of the iconic British secret agent at an invitation-only golden birthday party at the British Embassy in Dubai.